Bali attracts millions of tourists per year. And it’s easy to understand why many return over and over. However, Indonesia has many thousands of other islands. Islands so untouched and still raw that it is worthy of going out of your comfort zone to explore. For our trip to Indonesia last month, we decided to definitely explore beyond Bali. 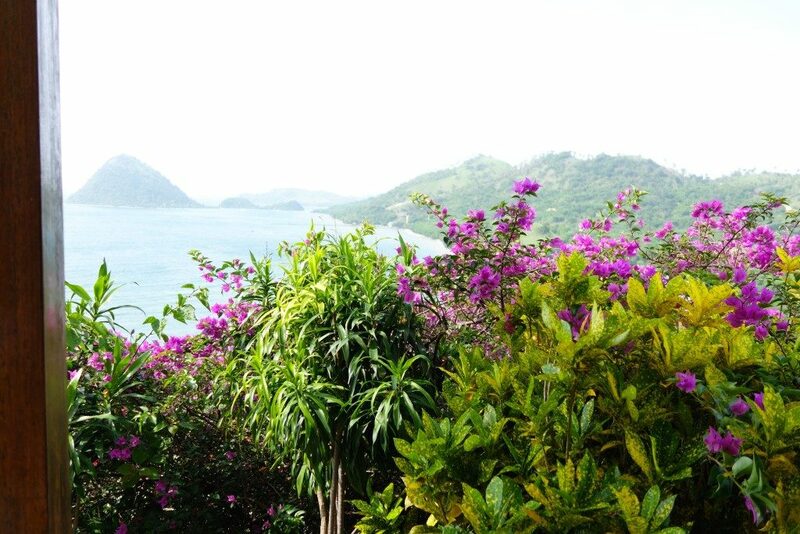 Just a 50 minute plane ride away is Flores. Flores is a huge island with an area of 14,300 square kilometres. The biggest town is Maumere, though the airport we landed in is Labuan Bajo. 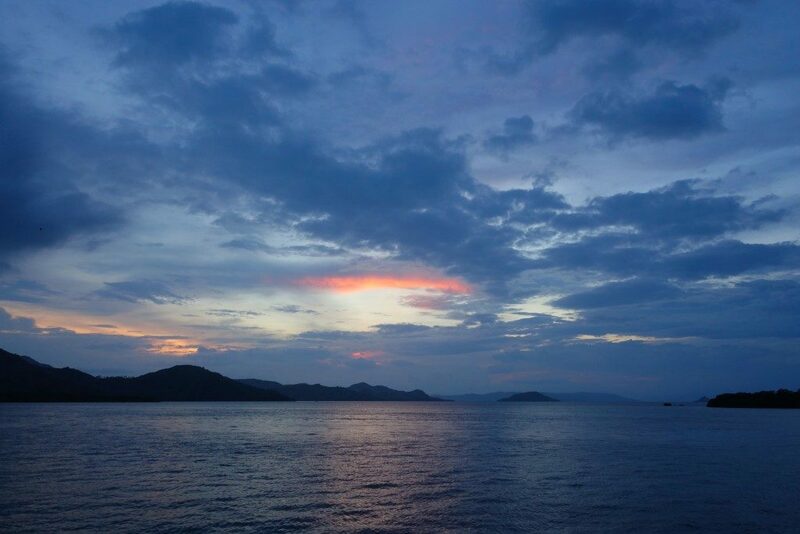 Labuan Bajo is the gateway to the more popular islands in Flores. The ones that bring in the tourists, Komodo National Park, home to Indonesia’s most popular residents: the Komodo Dragons. Unlike Bali, Flores is very different when it comes to independent travel. In Bali, you can probably land without any agenda and just walk in any hotel and you are good. In Flores, a town with a total of 2 traffic lights, it’s a different ballgame and you do need abit of preparation. 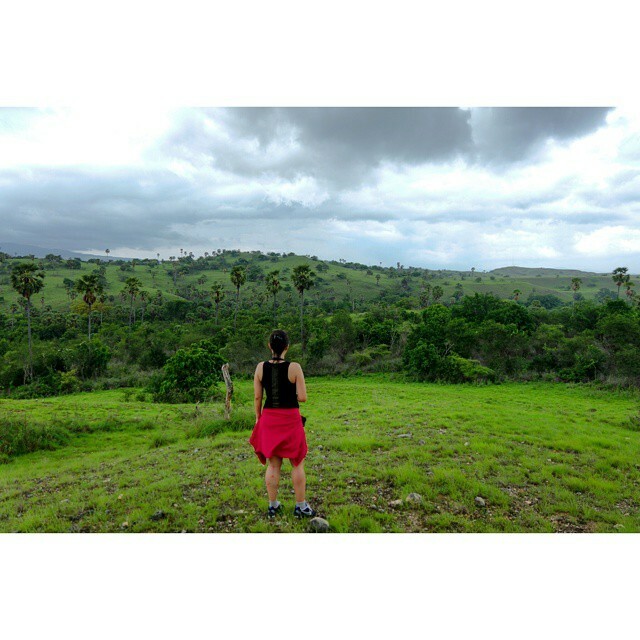 We went on a 4 Day Tour with Flores Adventure Tours , and here’s a rundown of our activities. Although Flores is Indonesia’s driest region, we were welcomed with rain when we landed. 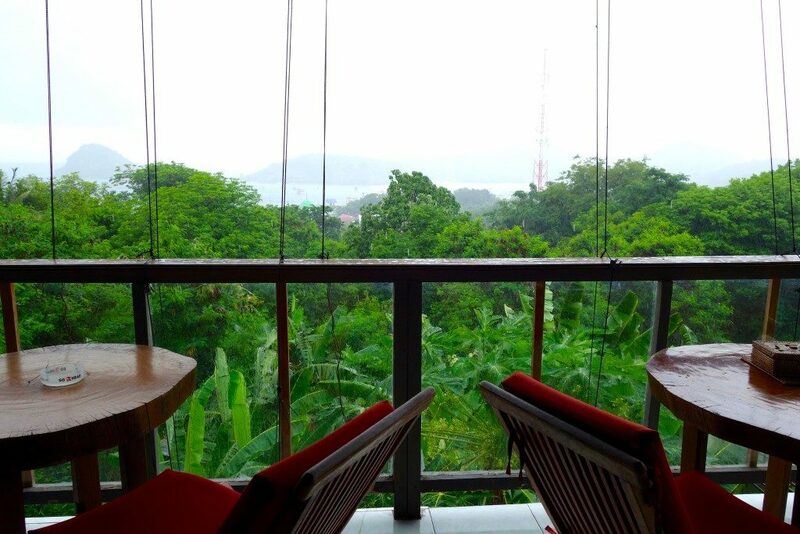 The atmosphere felt thick, humid, lush and most of all– clean. We were picked up by the private van of Flores Adventure tours where we met our guide, Kanis and our tour driver, Tian (short for Christian). Flores is a predominantly Catholic region in Indonesia, and Kanis, a local of Flores, is proud to say that though most of the people in the island are Catholic, all religions co-exist peacefully in Flores. And to counter the rainy welcome, we headed to a restaurant that overlooked the port of Labuan Bajo and had a fresh seafood lunch. 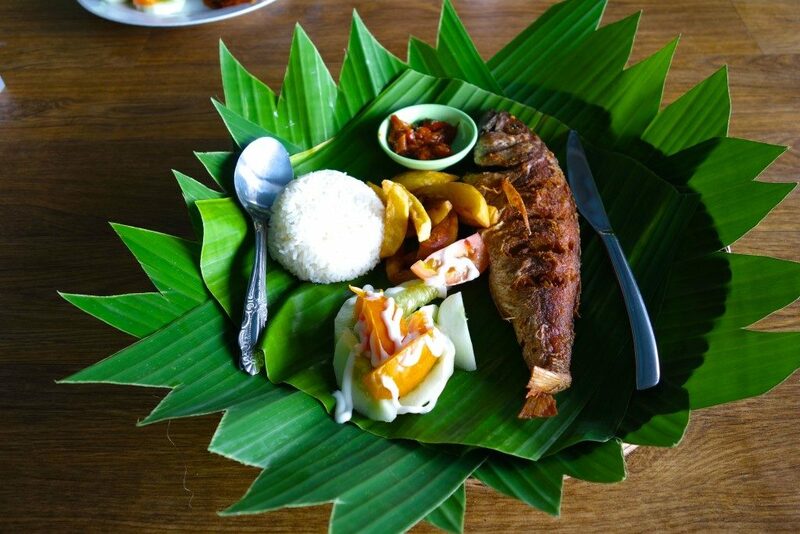 This lunch was one of the best I’ve had in Indonesia the fish was just so fresh. Kanis explained to us how the weather had been like the past week, and as we were going to overnight in the boat the next day, he advised that his job as a guide is to play things by ear and common sense. If the weather and tides are too strong, we may switch things around in the itinerary. Though he will do his best to ensure we tick all activities in the itinerary, he firmly stressed that safety is his priority. 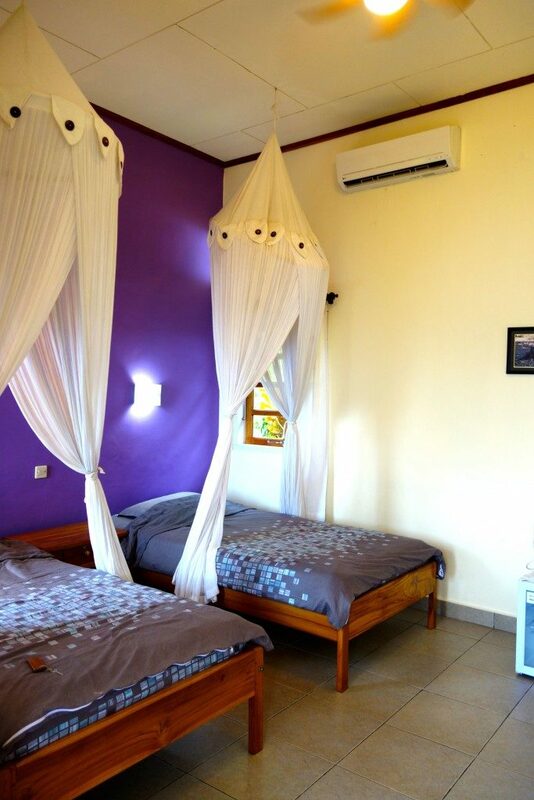 2 of the 3 nights in the tour are in Golo Hilltop Resort, a Dutch-owned accommodation that probably has one of the best views of Labuan Bajo. And that promise did not disappoint. 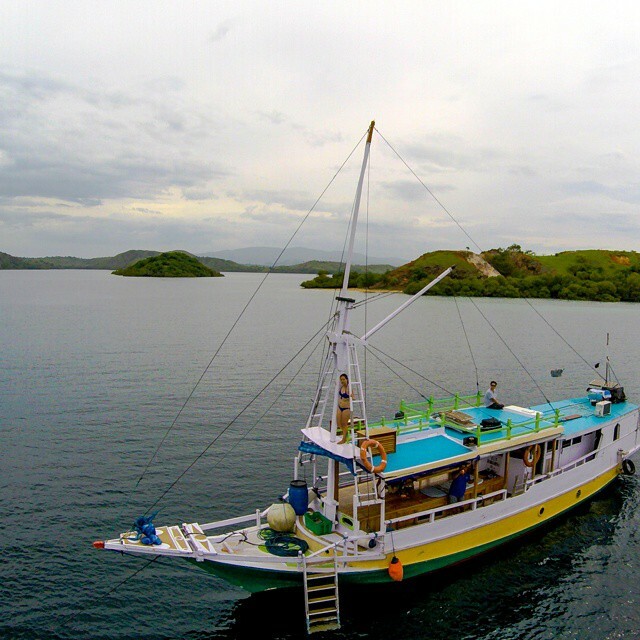 This is the day we set sail for the Komodo Islands and overnight in the boat. It was raining heavily and true to his word, Kanis refused to board the boat while it was pouring. 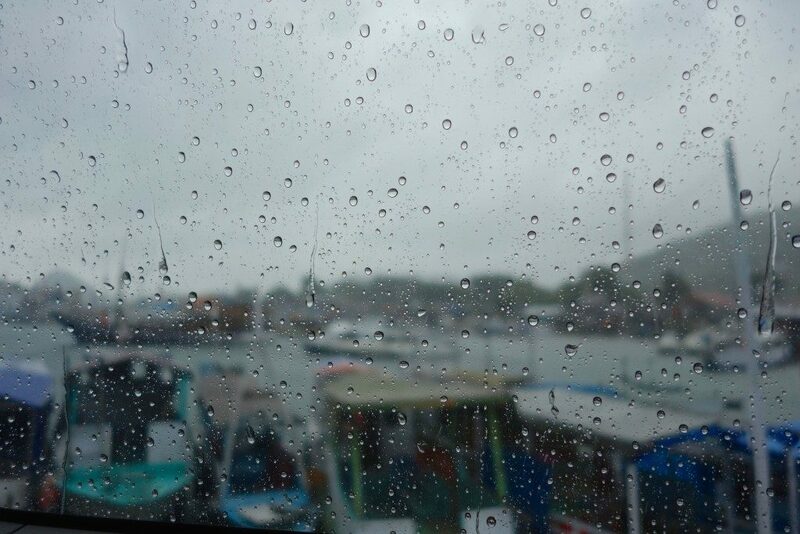 We waited at the port (while inside the van) for the rain to subside. We were more than happy to oblige. After about 20 minutes, the rain stopped and off we went. Our boat, named KLM Fammasena is very clean, and is owned personally by the boat captain so I can tell the boat is his prized possession. There are 2 other crew under the captain. So overall there were 7 of us – 1 Captain and his adorable 3-year old son, 2 crew members, Kanis our guide, and Zombie and myself. 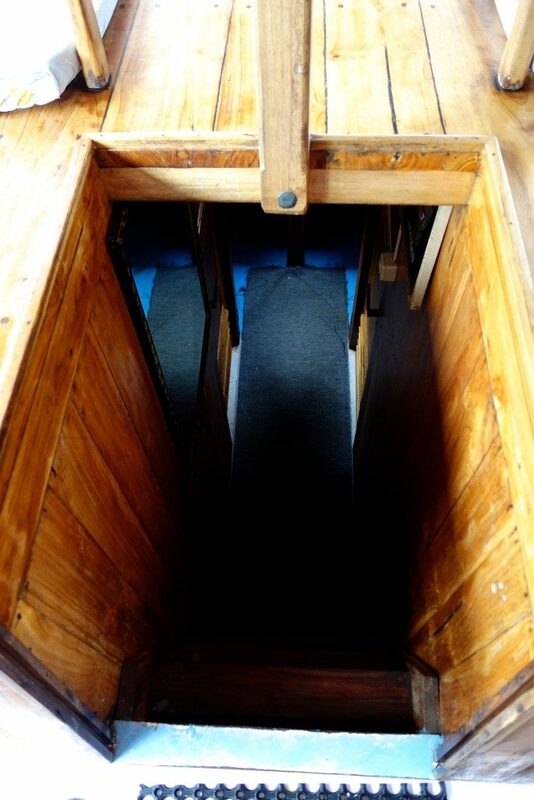 There are private rooms at the bottom of the boat. They are air-conditioned too. But we opted to sleep outside, taking with us all blankets, pillows and mattress, where the cool fresh wind lulled us to sleep in no time. 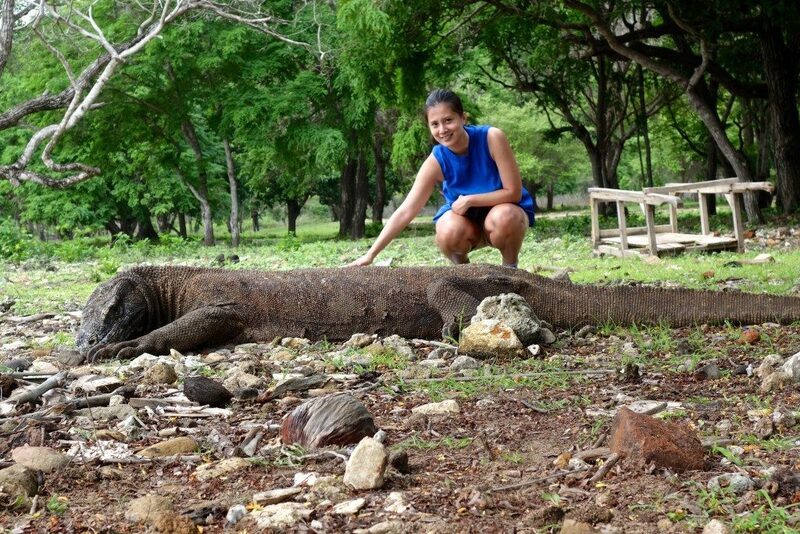 There are two islands in Flores where you can find Komodo Dragons. 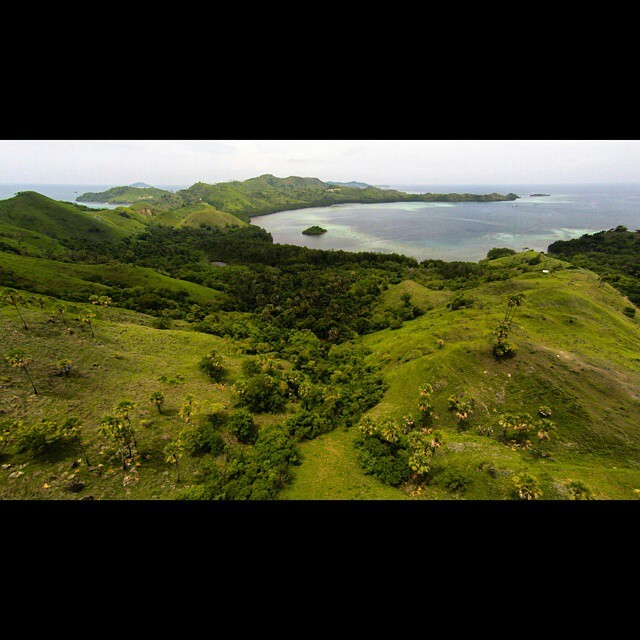 The first is Rinca, close to Komodo Island. 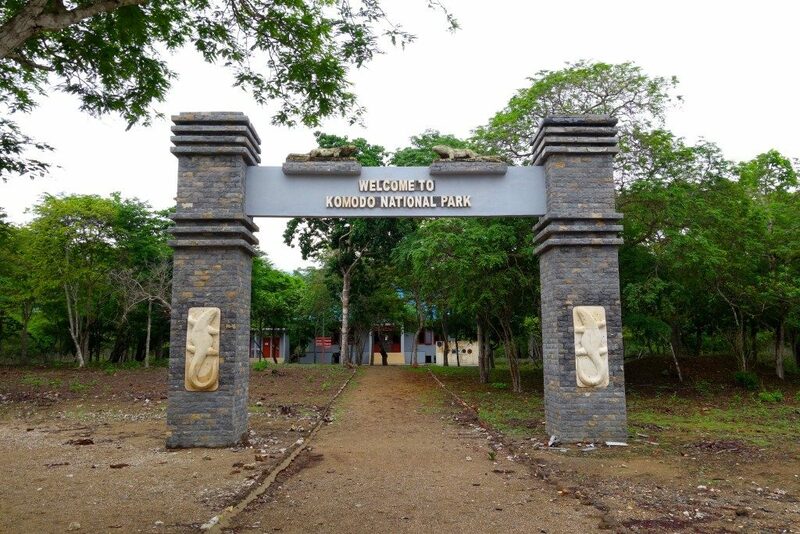 Though there are about 400 LESS Komodo Dragons here (2,400 vs Komodo Island’s 2,800+), the land area is also smaller so you have more chances to see Komodo Dragons. 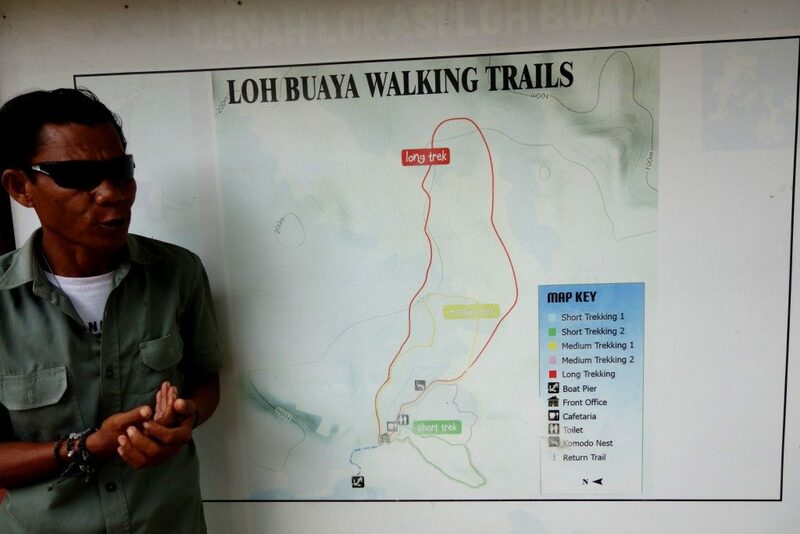 Our guide, Mr Lehman (who speaks with a very amusing Jamaican accent) shows us our trekking options. We opted for the Medium Trekking. It was moderate difficulty, my legs and arms had additional bug bites towards the end but it was worth the trek. Along the way we saw dragons. Though they look quite placid, the guides all have a stick that resembled Gandalf’s to poke them should they lunge very quickly. So I probed more. Apparently, a guide was leading a couple and the female had her monthly period at the time. These dragons can smell dead animals and blood for up to 9.5 kilometres away. So one of the dragons lunged at her, and the guide wrestled with the dragon using his stick. The guide was bitten on the leg in the process. He was airlifted to Bali and at the time of Mr Lehman telling me the story, the guide was back at the range. 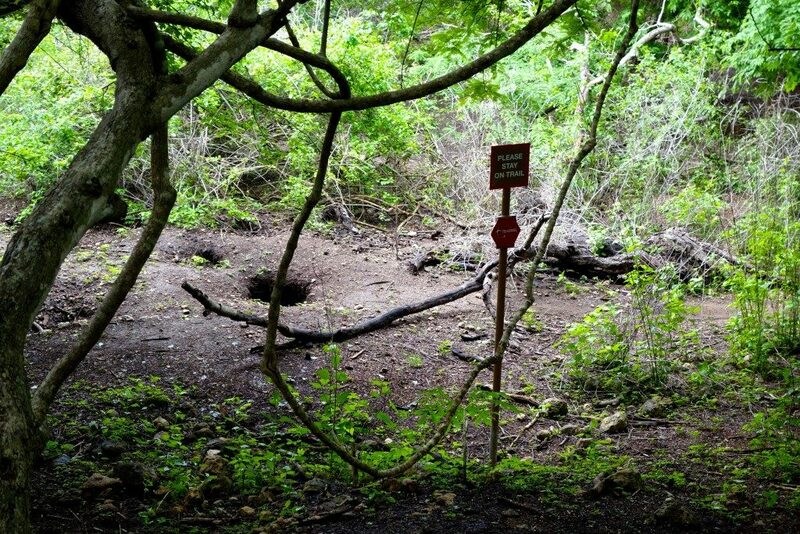 Along the way, we saw some holes dug by a Komodo Dragon mum. She digs about 5-6 holes to confuse predators (usually fellow Komodo Dragons) as to which hole the eggs really are. A very interesting thing I found out : Komodo Dragons try to avoid wild boar. Because when a wild boar is caught, it squeals noisily and the wild boar’s posse will come charging at the dragons in packs. So the dragons learned their lesson and prefer the ‘quieter’ animals. 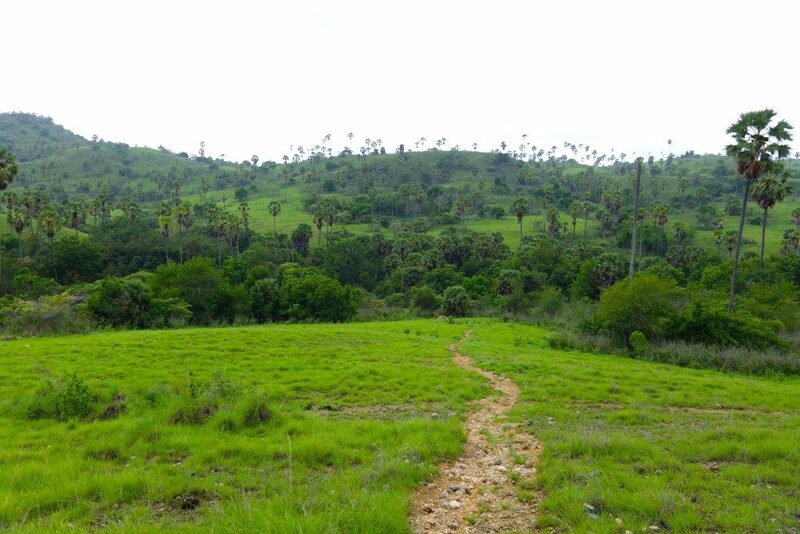 Rinca island is very lush and thick. In some angles it reminded me of Jurassic Park. Even the trees are deadly in Rinca island. 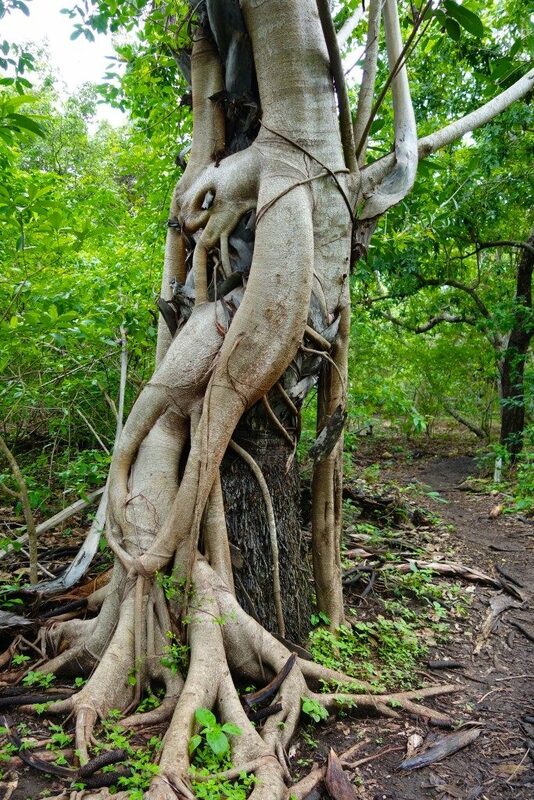 The Banyan tree (the lighter shade one), grows by wrapping itself in a ‘host tree’ (the darker one), and when it is large enough, it completely engulfs the host tree until it disappears. Without fail, whenever we would do a land activity, as soon as we hop back on the boat, food and refreshments will be waiting for us. Very impressively prepared by our Captain and his crew, it is always a 4-course meal with dessert! 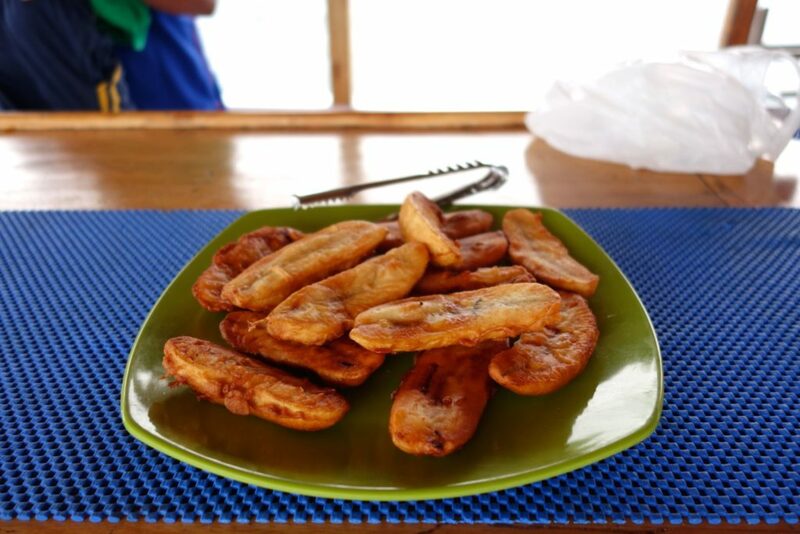 You may probably think that food prepared by a captain and boatmen are done haphazardly but seriously, these guys are very multi-skilled. It’s beyond us how they were able to whip up these dishes in their tiny kitchen. Fresh seafood, vegetables and fruits! Even afternoon and morning tea are served fresh and on the dot. They’re very creative and resourceful. 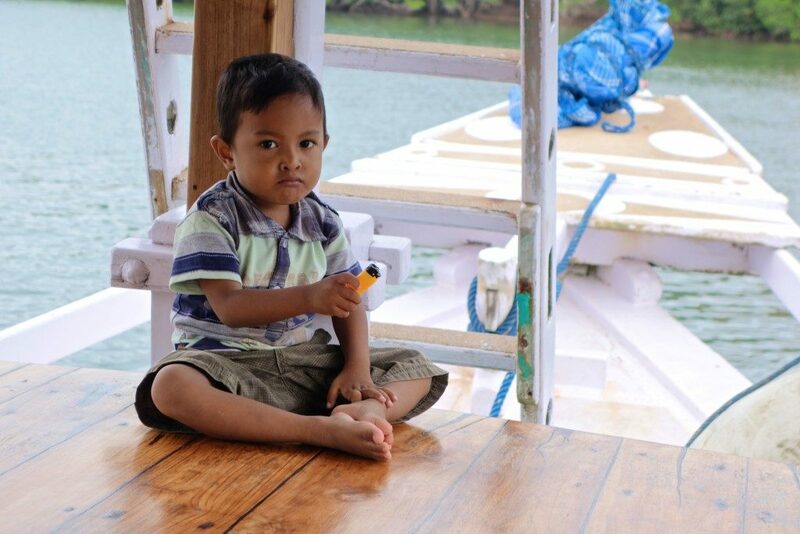 Sometimes, Agung, the precocious 3-year old Captain’s son would join us. 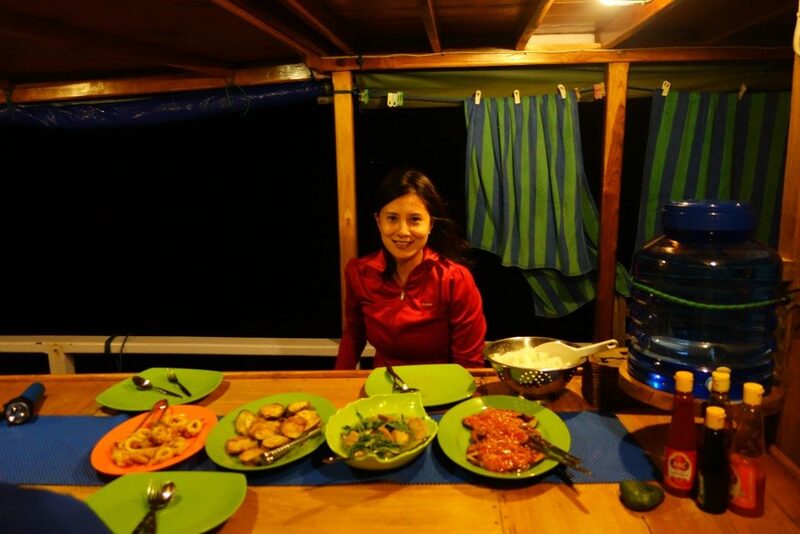 It was great lingering over meals especially that dinner as the boat was just docked while we spent the night. We also got to know our guide Kanis more, who is not only Catholic but was an ex-seminarian too! 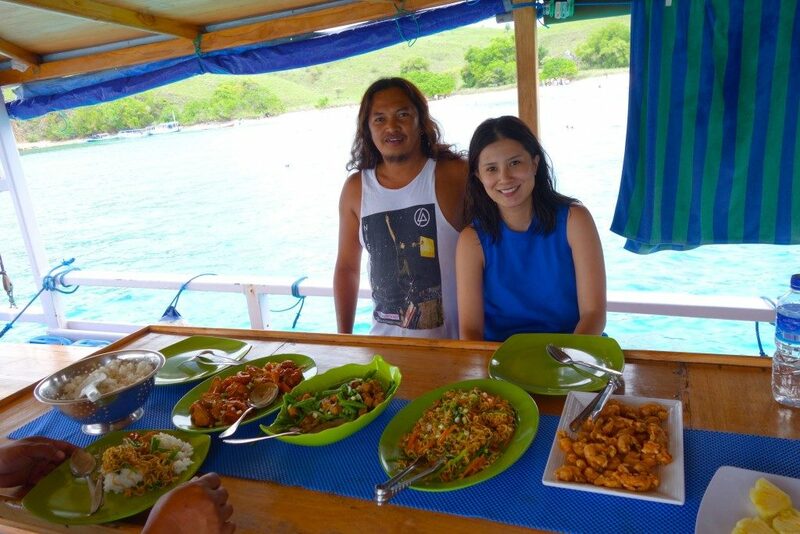 And with fatherly mannerisms, our Captain would beam whenever he saw us enjoying their food creations. The captain and I on the last day’s lunch. Look at his shirt, Linkin Park! 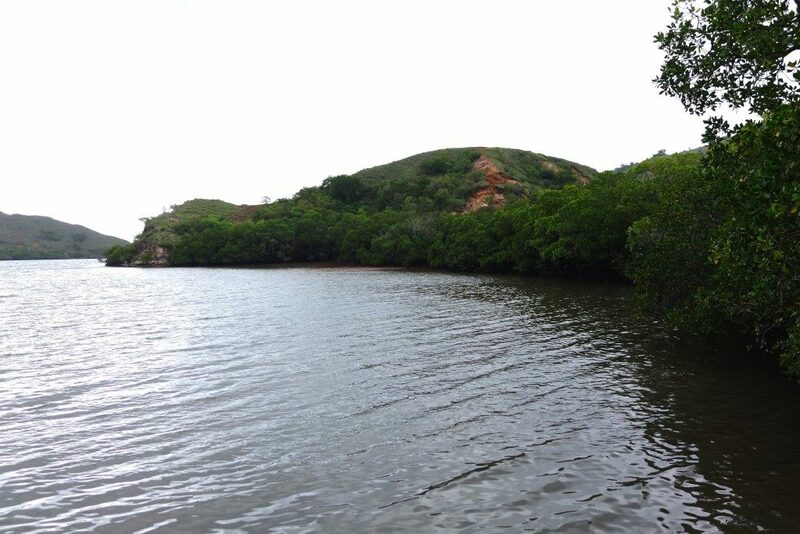 We also went snorkelling in islands next to Rinca but they weren’t very clear. Then we watched fruit bats migrating as the sun set. 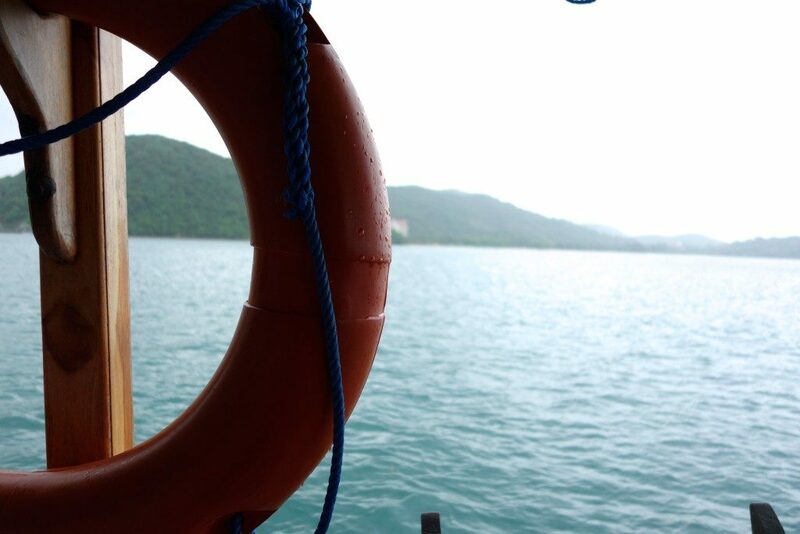 The next day, Zombie woke me up to tell me we were close approaching Komodo Island. When I opened my eyes, I saw a looming ship next to us. 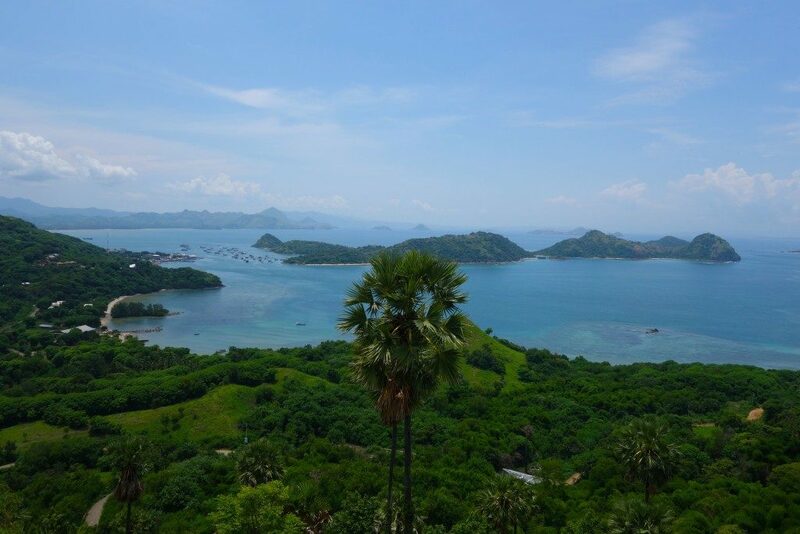 Komodo Island being the most popular attraction in Flores, it is regularly teemed with tourists (mostly from Europe). This time, a huge Celebrity Cruises X ship was docked and was batch by batch (in small boats) transporting its guests to Komodo Island for the day. We didn’t want to be exploring the island with a massive crowd so our boat being smaller, we reached the island first (versus the smaller boat/ rafts of the cruise ship that went back and forth from the island to the ship). 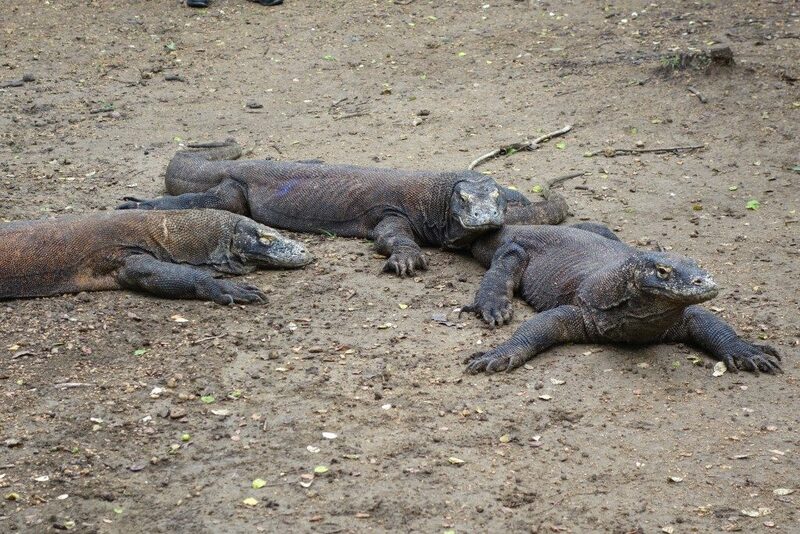 Komodo Island is much bigger, so the dragons are more spread out. Our ranger told us that when they found out that a huge cruise ship was arriving that day, they killed a goat to use its scent as bait for the dragons to come down to the main area. They are not allowed to feed the dragons so I imagine the dragons must be frustrated, smelling something but not seeing anything! 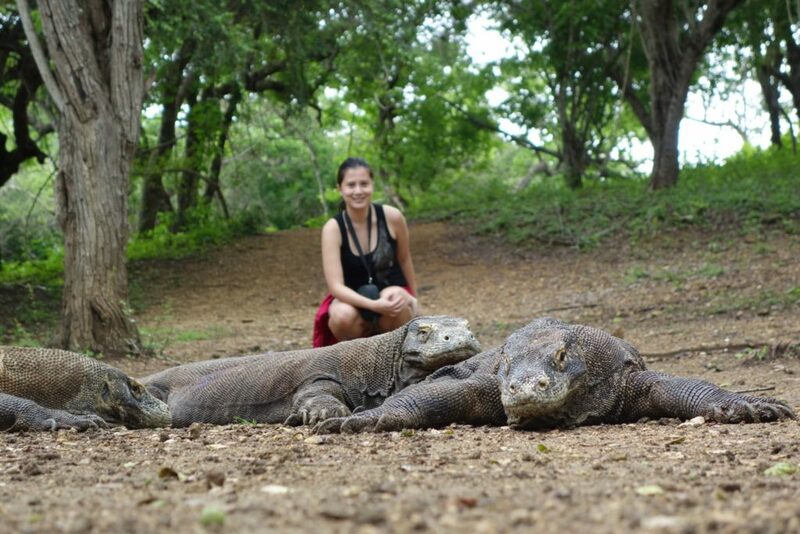 I do have to say, the dragons in Komodo Island were bigger. They seemed more active too. But it requires more exploration because they are not just found in one central location. Very close to Komodo Island is Pink Beach, where the waters are very clear and I had the most amazing time swimming after a turtle! 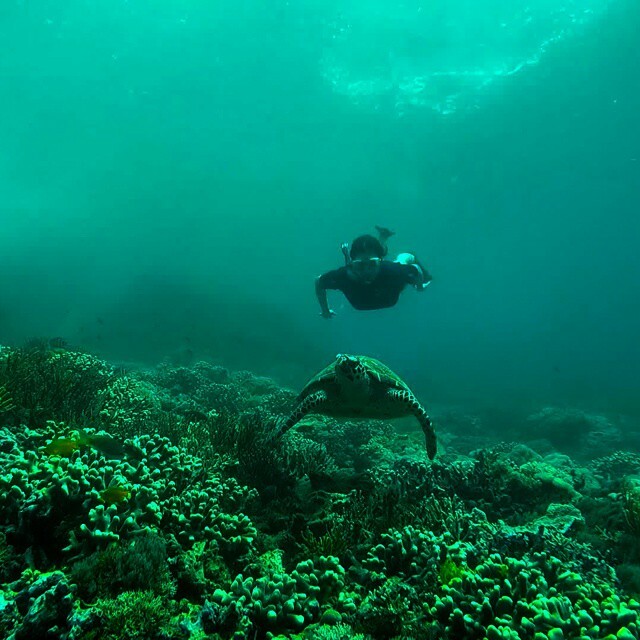 Komodo Islands are very popular for diving, but December – February is not dive season due to visibility and tide. But we lucked out swimming at Pink Beach. The current was very strong but the visibility was quite good. 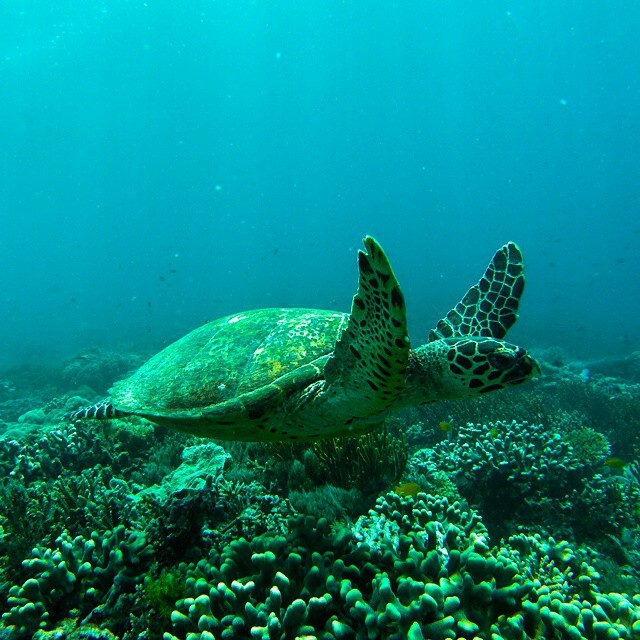 So even if it was such a task swimming after this turtle, we tried so hard swimming after it. We also saw small rays but they moved very quickly before we even got footage. 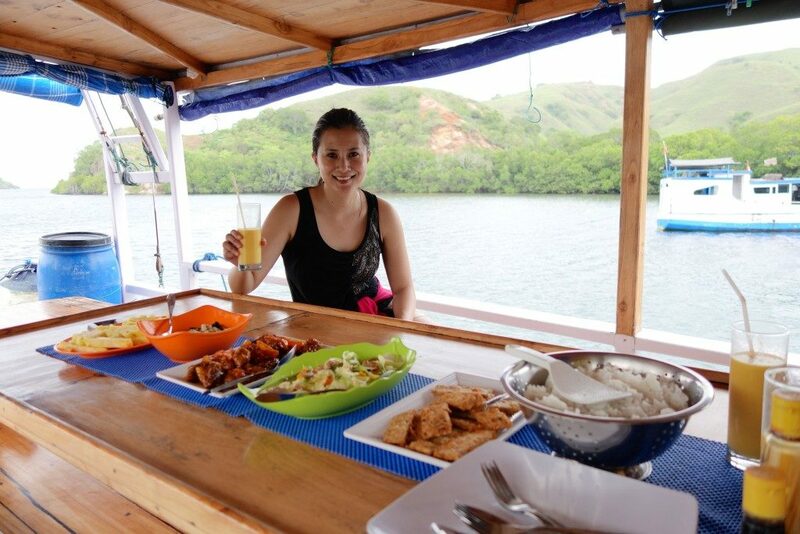 We then had lunch in the boat and sailed back to Labuan Bajo. This kind of trip cannot be complete without a video, here’s our adventures during the 4-day, 3-night tour! This was definitely one of the most memorable 4 days we’ve ever had. 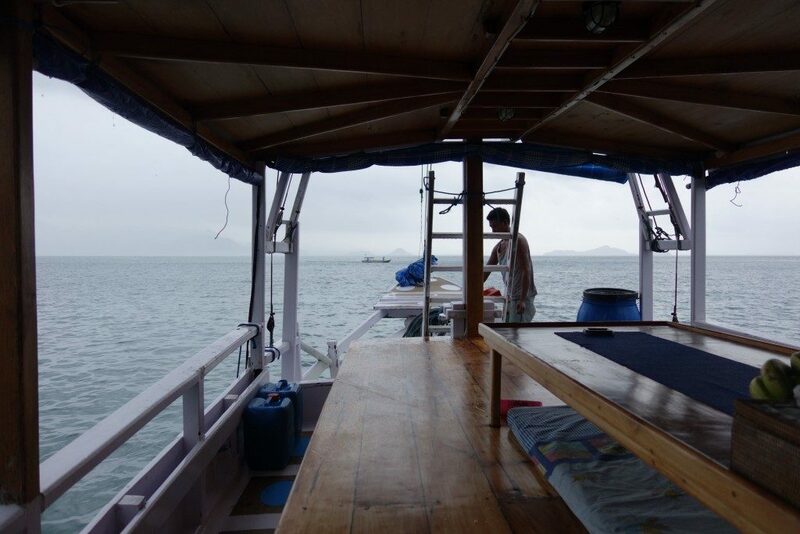 Going out of our way to explore wildlife, and experiencing staying overnight on board. We also felt very much taken cared of by our guide Kanis and our captain and his crew. but all opinions and views of the tour are our own. Dude…. this post is EPIC!!!! 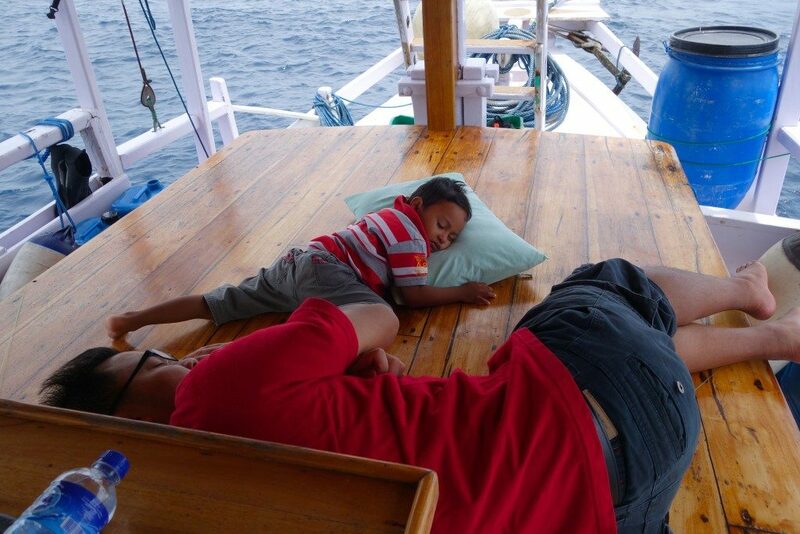 The boat sounds magical, love the picture of the snoozy kid, wish I was there right now. The dragons look scary, but good on you getting that close to them. How amazing does that food look, its lunch time now, the buffet made my tummy grumble. Far out, you went diving & caving too. What an adventure. Adding to my bucket list. Hope you are well lovely. Thanks Anna!!! Yes the kid is really like a young man in a toddlers body! he plays with a lighter too but his chubby fingers can’t light it up yet. Yes the food was so amazing! Considering they just made it in this tiny kitchen! I’ve no idea how they managed! 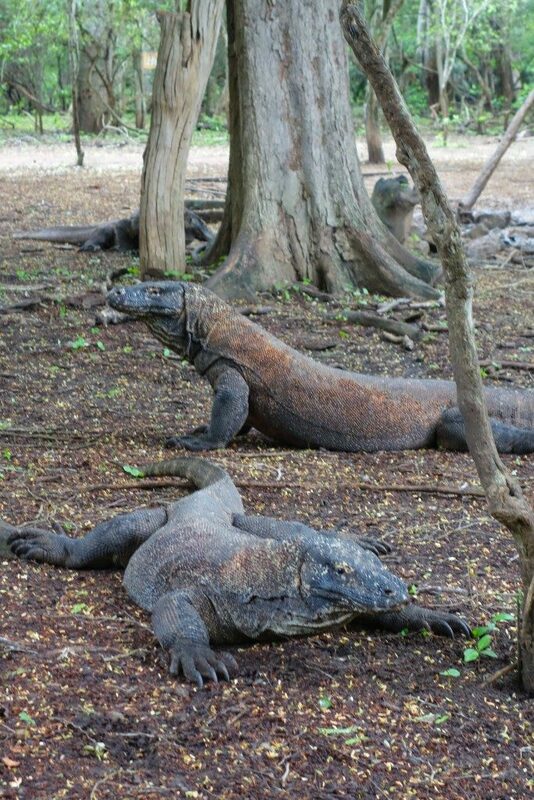 Great post, I really want to see komodo dragons in the wild. I have noted to plan this as best i can around the monthy or wait until menopause! Love the pic of Zombie and Agung. 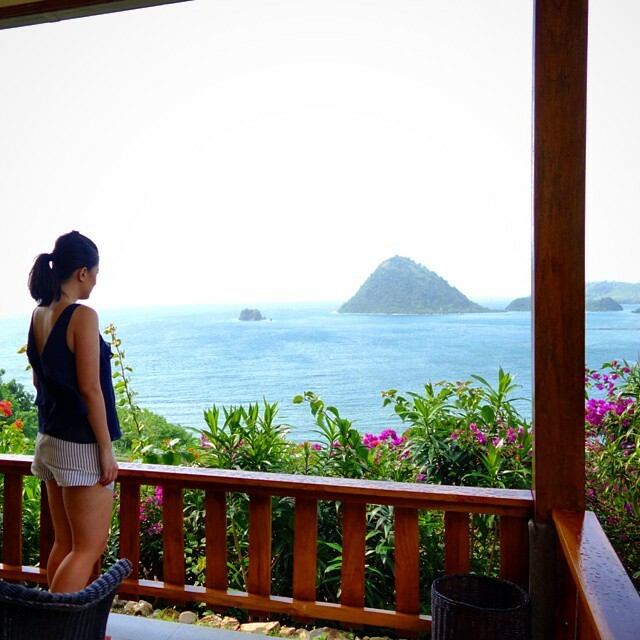 Thank you, that 1 week in Flores was indeed Bliss! Wow Jean this sounds AMAZING!! Hadn’t heard of Flores, though will definitely be adding it as a mental note for when we do eventually get to Bali – looks spectacular and well worth the 50 minute trip. 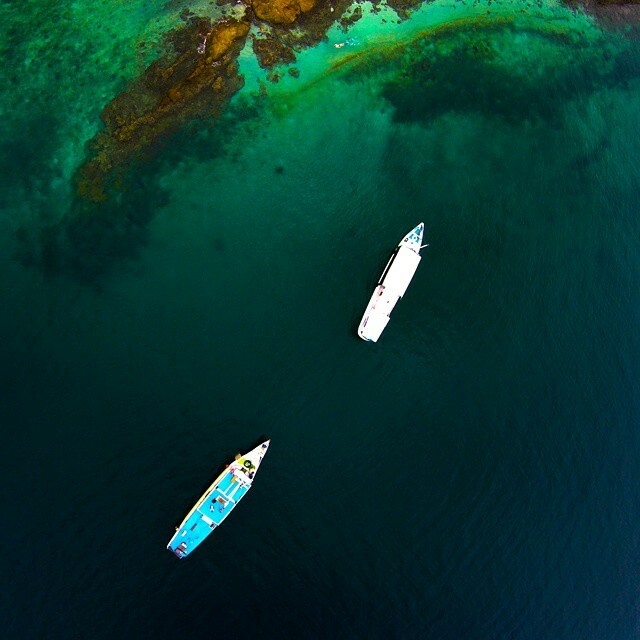 And OMG WOW Komodo National Park has been on our list for the longest time, it would be a dream to eventually get there. So glad you had an amazing time, love the video! We always go to Bali because we adore it but you’ve inspired me to go a bit further and explore more of the areas around it. Do you remember when Sharon Stone’s ex husband got bitten by a komodo dragon? Such a random thing to remember and associate with them! Thank you Suze! Yes if you do get the spare time I highly suggest heading to Flores. 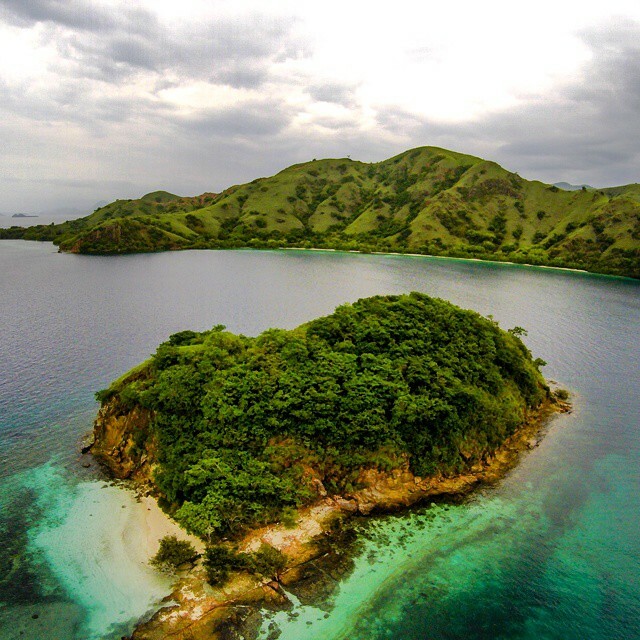 Taking the domestic flight from Bali to Labuan Bajo is the most convenient way. What a great adventure (and video!). This looks like a worthwhile tour and you saw lots of dragons! I’m amazed at how large some of them are particularly compared to the ones I’ve seen in zoos. I also didn’t appreciate how dangerous they can be towards people and the size of prey. They must be pretty hungry creatures. I want to go!! Those dragons are enormous, you look very calm, I’m sure my heart would be racing VERY fast. Looks like a marvellous trip – noted for the future. What amazing photos, and scenery! Hi! Great video! 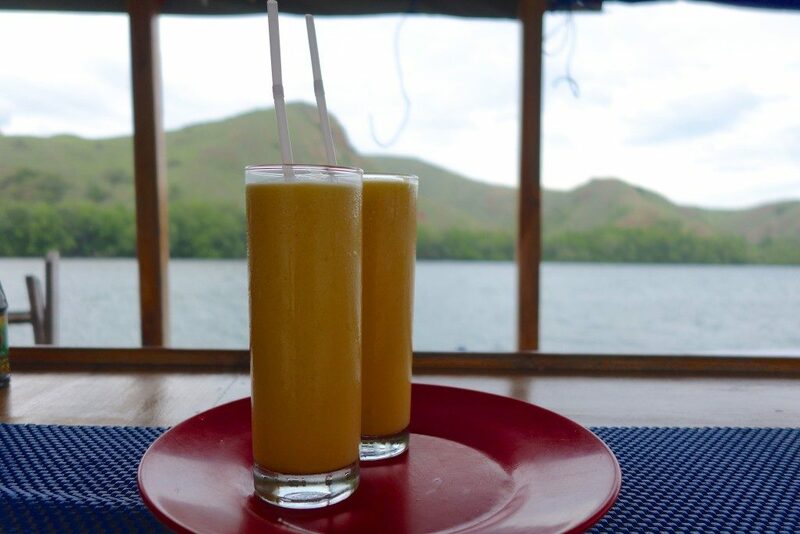 Just wondering – in which month were you visiting Komodo? Thanks! Thanks for the info, Holly! We are going next week – I was mostly wondering if we should it expect it to by brown and dry, or green and lush like in your video. Do you know if the diving is okay in November? Thanks! That’s a great adventure! Thank you for all the information. My family and I are looking to go there this coming end of July. I tried to go to the link you gave Flores Adventure Tours and no longer exists. Do you happen by any chance have their other contacts? I tried to google it and the closest I came across are FloresXP and Flores Discovery Tour. Thanks! Hi, great blog post, I enjoyed reading it. On which month did you visit? Hi Jason, I visited in January! Rainy period but I still had a great time. Beautiful post and thanks for sharing. We are visiting this June and hoping for a great time. We are following your advice and staying at Golo.